Are these limits actually enforced, either through a speed camera or by policemen carrying a radar? Yes, these things are enforced. A different answer says enforced in areas that are urbanised, substandard, accident-prone, or under construction, this is at least misleading. Those areas are more prone to having any speed limits at all, but if there are any, they are enforced, no matter the area. In both of these cases, you won't get pulled over, you'll be photographed for evidence purposes and get a ticket later. If you're a tourist and have a rented car, the ticket will go to the car rental company which will deduct it from your credit card. Video surveillance cars. (This is what got me once). They just drive behind you for a few km, make a video of you driving, then pull you over as that's the only way to make sure who the driver is when they don't have a picture. They will watch the video with you and give you a lecture about how dangerous was what you did. They will not trust their own speed-indicator; they will send the video to an expert who will determine your speed from a timer that's shown on the video and landmarks, mostly the lane markings. If you're speeding, and some other car behind you seems to "want to give you a race", make sure to decelerate (not brake!) and adhere to the limit, especially if the car behind you has 2 adults sitting in the front row. (For reasons of evidence these cars always have two policemen). "Random" police cars. If you're way faster than you should, they will pursue you, but in most cases, you won't get any else than a stern lecture. Happened to me once as well, I was driving 200 in an area that had a 120 limit, late at night, almost no other cars on the road. I noticed I was overtaking a police car right the second I was next to it; they pursued me and pulled me over. They told me they estimated my speed at 190, but as they were not equipped with a calibrated speedometer, they had no evidence, but warned me had I got caught in a radar trap that would have been 3 month without driving license for me. After promising to be more careful they let me go. More than 40 km/h over the limit (Autobahn and outside towns) or more than 30 km/h will mean a temporary ban of your drivers license. If you're a foreigner, they won't take your license, but you will still be forbidden from driving. Getting yourself caught again will be very expensive and may even give you some time in jail. Same if you get caugt more than 25 km/h over the limit twice in 12 months. Between 20 and 30/40 over the limit, you'll get in a special database where some points are assigned depending on your speed (you get the same points for, for example, ignoring a red light); if you accumulate too many of them your license get temporarily suspended as well. Less then 20 over the limit will cost you some money, but in normal cases, no further consequences. So if you're speeding, try to keep it below 20 km/h. Of course, if there is an accident, your speed will be held against you anyway. The German Ministry of Transport has a website (in German) that lists costs in Euro, database points, and months of license ban. The first table is in towns, the second outside towns. Those are the fines for normal violations by normal cars; they are generally higher for trucks or in circumstances that are especially dangerous (dense fog, railway crossings, ...). In English: Who drives a vehicle must not use, or possess in usable condition, a device that is intended to show or disturb traffic control measures. This is especially the case for devices that disturb or show velocity controls. ("Possess in usable condition" means "ready for use", this does apply to a device on your dashboard that's switched off, it does not apply to a device in it's original package in the trunk. Long ago, possession was banned as well, but as some EU countries do allow those devices, they had to make mere possession legal). Es liegt jedoch in der Verantwortung des Nutzers, sich vor Fahrtantritt über die jeweils geltenden Regelungen im entsprechenden Land selbst zu informieren. EDIT: I've rewritten my answer, especially to address the question about the variable speed limit. These signs can show different speed limits, which is for example used as flow control. If there's much traffic or even a jam ahead, speed limit is reduced. In general, these signs are as valid as their normal, printed counterpart. 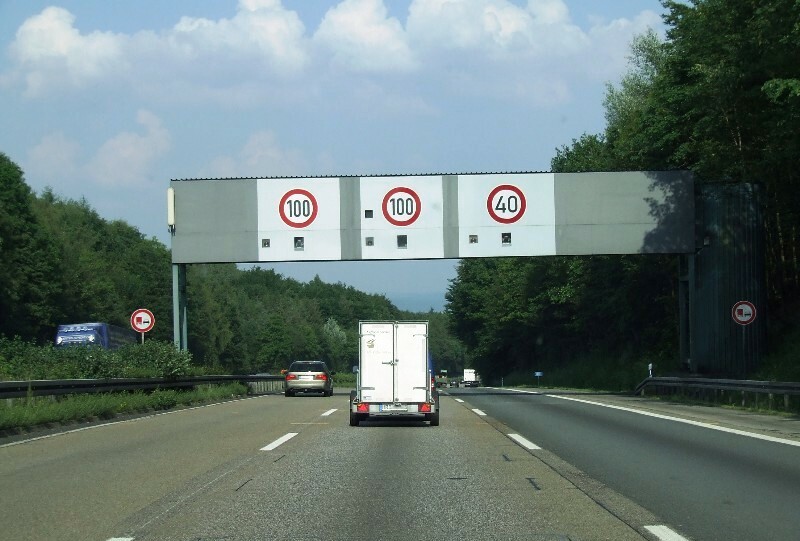 Speed limits are of course enforced in Germany, though the fines are relatively low compared to other countries. 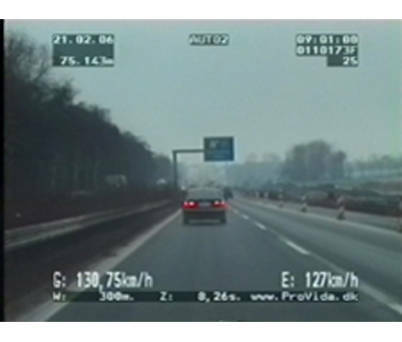 A laser speed gun is often used by the police, but of course not on the autobahn. But they have civil cars (i.e. no police cars) with a video recording system, which is also calibrated for precise speed measurements. This videos are also conclusive when you go to court. We don't have many of those cars, and they are more or less looking for the really bad guys, which drive waaay to fast or show other bad driving habits. 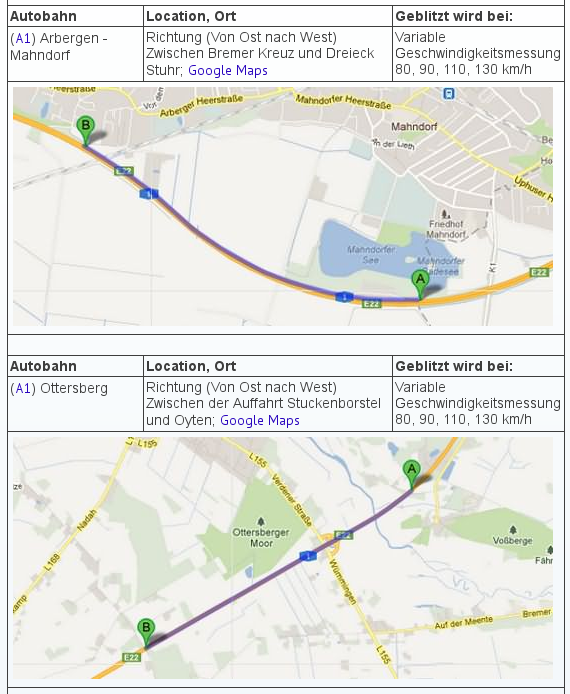 Ah, and there are some pilot projects for cameras measuring the distance between vehicles on the autobahn, because it is often way too low. Police will always stop and fine you directly. Any kind of speed camera is operated by the city, district or state, and you'll receive a letter from them, not the police. As others have noted, these temporary speed limit signs are equally valid as permanent signs are. As such, when speeding and getting caught you face the same consequences as if there had been a fixed sign on the roadside. 10 % + 3 km/h, rounded up to the nearest multiple of ten. Attempt that kind of speeding in other countries and you are in for big fines. Another point is that — despite what many people perceive — speeding fines in Germany are rather low when compared to other European countries. If you are caught driving 140 km/h (measurement tolerances already deducted) on the motorway on a stretch where 120 km/h are allowed, your fine is merely 30 €. 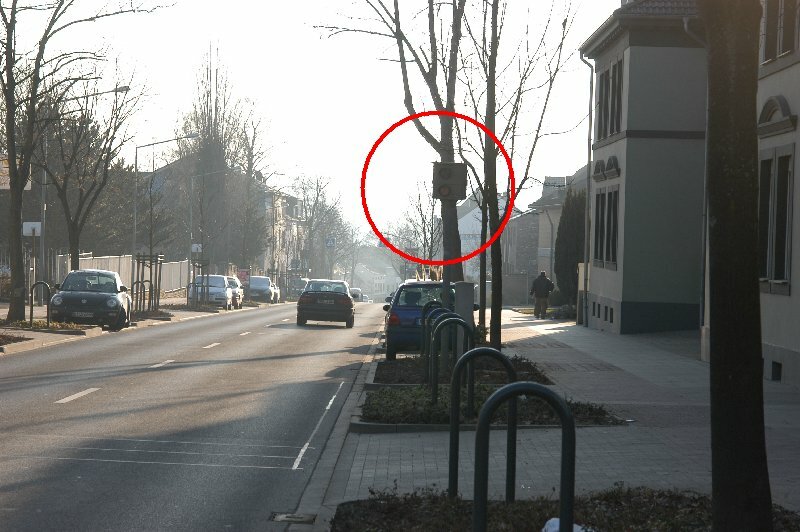 The density of speed cameras varies greatly depending on the Bundesland you are in. Baden-Württemberg is on top of the ladder with over 1100 fixed cameras while Bavaria, despite being the largest state, only has 85. (Numbers from early 2015) The police ‘have better things to do’ in many areas rather than stand around and enforce speed limits. So altogether, there is a strong lenience towards speed limit enforcing. This means, if the temporary speed limit is 120 km/h, most drivers will drive at 130 to 140 km/h, and even if the police do measure, this is unlikely to get enforced. Go with the flow and typically nothing will happen. If enforcement is present, they will be on the lookout for the blatant speeding outliers. As pointed out by @sweber these signs are valid and this being Germany, yes the limits will be enforced. I've been passing through one such stretch fairly frequently and while I have never seen mobile radars there, I have been warned of popular spots and have frequently heard the warnings on the radio. Also the vast majority of drivers really sticks to the speed limit (with German precision) in that area. The system of temporary traffic controls is used for controlling the flow of traffic around peak hours (in theory, in reality always), alleviating traffic jams and avoiding accidents (i.e. slowing down traffic before hitting a jam / construction site / accident site). 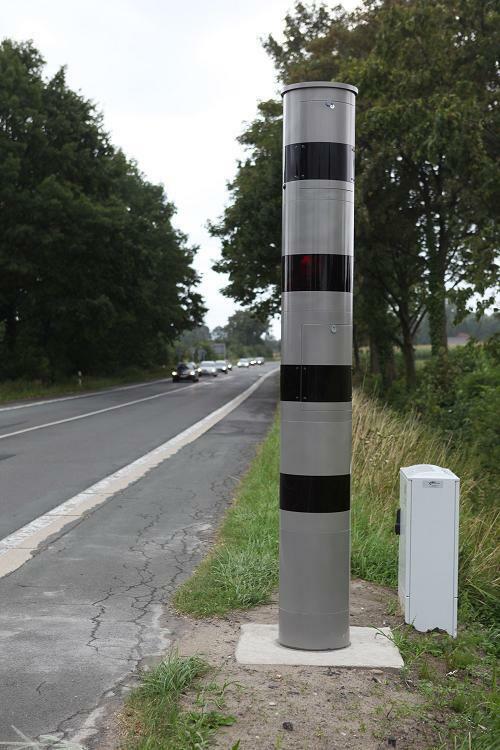 In the aforementioned section there are cameras on poles throughout for monitoring traffic and most people do stick to the limits (within 10km/h at least), so I would be very surprised if there were no controls at all. In fact, if not knowing the place you should always expect mobile controls and drive within 10km/h of the limit). Police cars might try to catch you if you really exceed the limits as mentioned by @sweber (but personally I feel 30km/h over the limit might only trigger them on a bad day). Finally, here is a map with permanent speed controls. Mobile ones are also announced on the radio (on most stations, in German, every full and half hour after the news) and there exist apps. 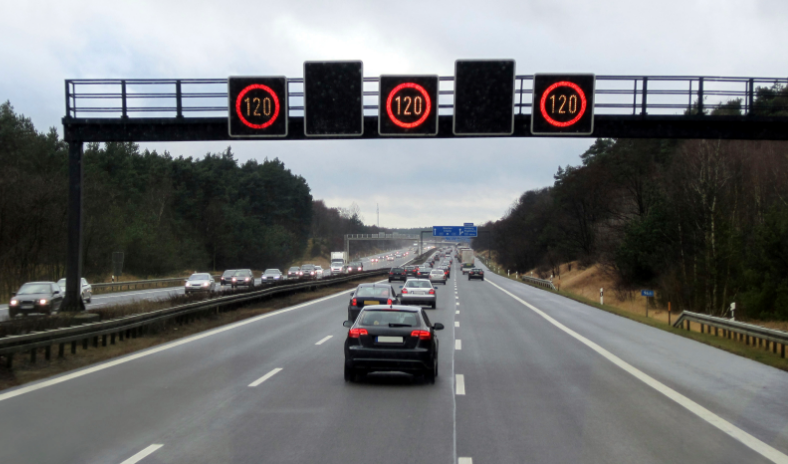 Currently, 52% of the German motorways do not have a speed limit, 15% have temporary speed limits due to weather or traffic conditions and 33% have permanent speed limits. On unlimited sections there is a 130 km/h recommendation. So, in answer to your question - these temporary posted limits are enforced in 'areas that are urbanised, substandard, accident-prone, or under construction.' They can be enforced by speed cameras, but more likely mobile checkers. Speed limits for drivers with less than two years experience in Germany and Poland?